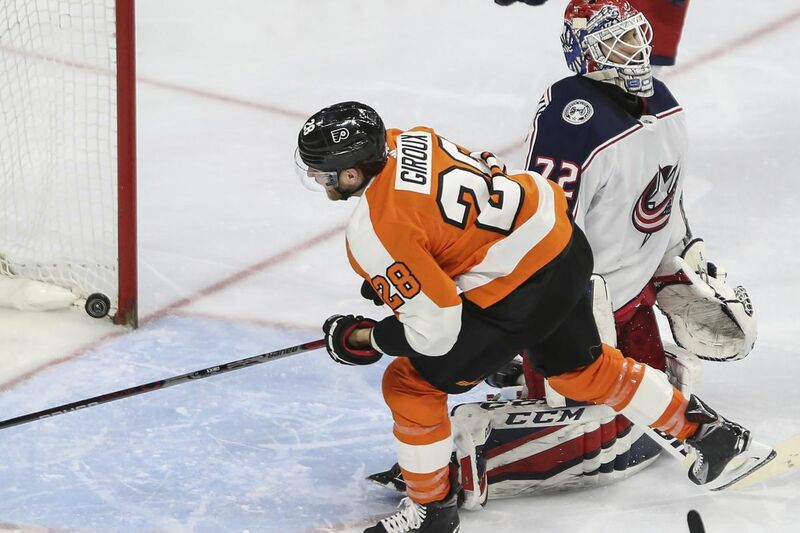 Claude Giroux, shown scoring against Columbus goalie Sergei Bobrovsky on Thursday, is fourth in the NHL with 72 points. SOCIAL MEDIA COVERAGE: @BroadStBull and @samdonnellon on Twitter. KEY PLAYERS: The Flyers will take a 10-game points streak into the game against a lowly Senators team that is cleaning house. The Flyers will be trying to avenge a pair of one-goal losses to superstar defenseman Erik Karlsson and Company. Will this be the last game Karlsson plays for the Senators? The 27-year-old Ottawa captain, a two-time Norris Trophy winner as the league's best defenseman, could to be dealt before Monday's 3 p.m. trade deadline. Tampa Bay and Nashville are among the many teams showing interest. If the Senators are close to a deal, they may even decide to sit Karlsson Saturday for fear of an injury. On Friday, the going-nowhere Sens dealt their No. 2 center, Derick Brassard (18 goals), to Pittsburgh. It is not known if defenseman Ian Cole, one of the players the Senators received in the deal, will be in Ottawa for Saturday's game. Goalie Petr Mrazek, who was outstanding as he keyed a 2-1 win over Columbus in his Flyers debut Thursday, is expected to face Mike Condon, who is 4-10-5 with a 3.31 GAA and .901 save percentage. Flyers top-line right winger Travis Konecny, who has 11 goals and 24 points in 25 games since being promoted to the top line, injured his left foot Tuesday and missed Thursday's game. He is listed as day to day. MVP candidate Claude Giroux is fourth in the NHL with 72 points, and Sean Couturier leads the Flyers with 29 goals. Mark Stone leads the Sens with 19 goals and has a four-game points streak (one goal, six assists). THINGS TO KNOW: Rookie Nolan Patrick has a goal in each of the Flyers' last three games…..The Flyers, winners of four straight, have the league's seventh-ranked power play and 28th-ranked penalty kill….Jake Voracek has a league-high 55 assists….Ottawa's Bobby Ryan, a top-line right winger who is a Cherry Hill native, has seven goals and 14 assists in 40 games…. The Flyers have not lost in regulation since dropping 4-3 decision to New Jersey on Feb. 1…..The Sens have lost three straight. HEAD TO HEAD: The Flyers lead the overall series, 44-32-8-8, but the Sens have won both meetings this season, including a 4-3 shootout victory Feb. 3 in Philadelphia. Monday: 7:30 p.m. at Montreal. Thursday: 7 p.m. vs. Carolina.